(CNSNews.com) – California ranks No. 1 among the 50 states for the percentage of its residents 25 and older who have never completed ninth grade and 50th for the percentage who have graduated from high school, according to new data from the Census Bureau. Massachusetts ranks No. 1 for the percentage of its residents 25 and older—42.1 percent–who have earned at least a bachelor’s degree. In California, according to the Census Bureau’s five-year estimates, the resident population 25 and older was 25,950,818. Of those individuals, 2,510,370—or 9.7 percent–never completed ninth grade. 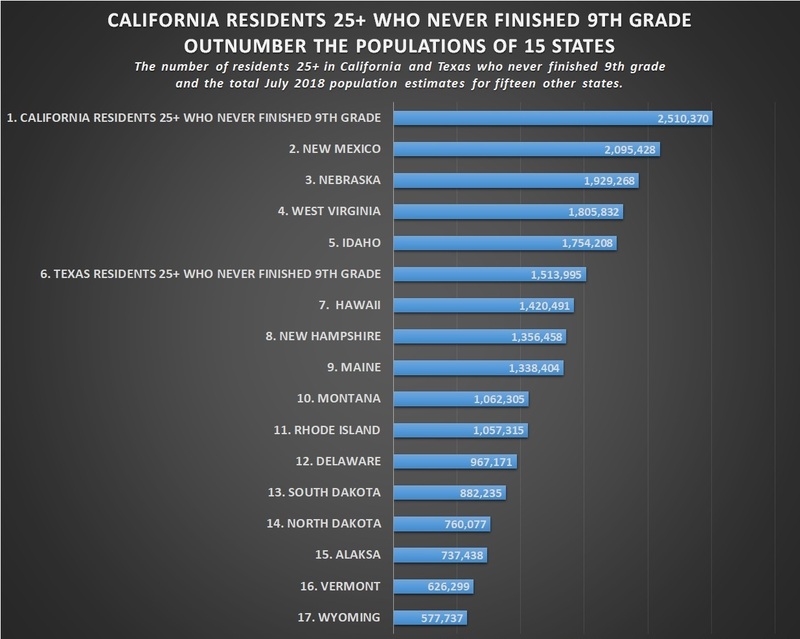 Another 2,033,160 California residents 25 and older completed the ninth, tenth, eleventh or twelfth grade—but did not earn a high school diploma. Thus, a total of 4,543,530 California residents 25 and older—or a nation-leading 17.5 percent–have never graduated from high school.